If you know Melbourne based Wolf of the Willows from their core range of beers, you only know part of the story. Over their two years as a commercial operation, they've broadened their palette via various keg-only releases, from relatively straight-down-the-line hops and malt led affairs to more esoteric drops, such as the Paradisi fruit saison. And now, given this beer comes with the suffix I, it appears there's a new line on the way that will allow Scott and Renae to explore the world of acid a little more too. 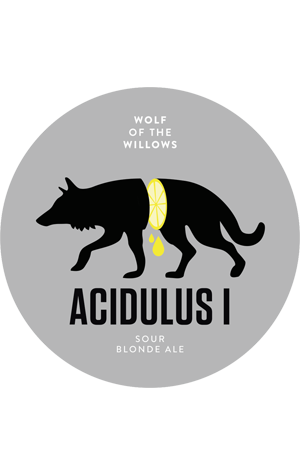 Acidulus is the Latin adjective for sour (the brewing company's name comes from a Latin term for hops) and, having been offered as a teaser at their second birthday, is hitting venues from December 8, when it's launched at The Cherry Tree. They're calling it a "sour blonde ale", one that based upon a mix of pilsner, wheat, rye and toasted oat malts but in which the stars are the souring lactobacillus bacteria and a "specialty" yeast strain. Scott is remaining coy about what said "specialty" yeast strain is but reckons it's the main factor behind the prominent tropical fruit aromas and flavours that will have you convinced the contents of a fruit salad were added to the beer (they weren't). It's got a bigger body than many similar beers released locally this year (presumably thanks to the rye and oats), with a sweetness balancing the underlying sour character. Roll on numeral II.